What does the F stand for? What do you do on a Friday if you want to indulge your need for quick luxury? You sit in a Jaguar F-Pace R Sport 3.0 litre monster and take a trip around the north Kent countryside, that’s what you do. I’d been a long time admirer of the F-Pace. Jaguar have had an impressive renaissance over the last few years, shaking the image of being motorcars for fuddy duddys and wannabe Cray brothers. The new XE, the F-Type and the F-Pace have all brought Jaguar to the forefront of fashion and performance. There isn’t an unattractive model in the line-up, every Jag, big or small, looks sweepingly effortless. Pop a tasty engine in them and the brawn quickly matches the beauty. 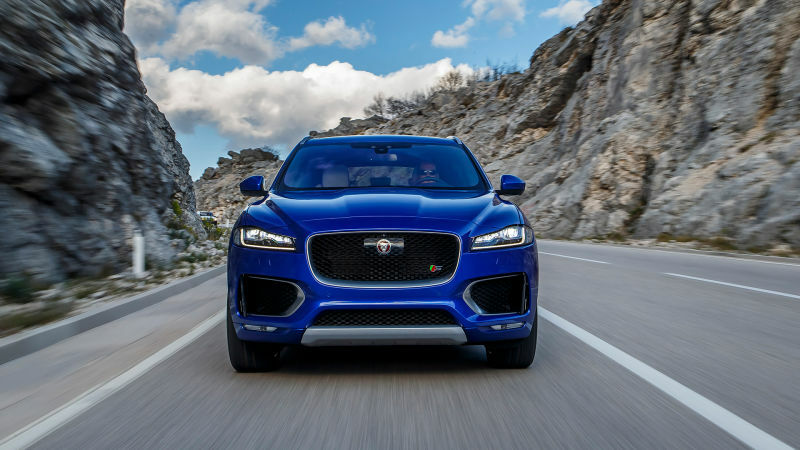 The F-Pace has been around for a little over a year now and it is easily one of the most striking cars on the road. It’s well priced (starting at £34,500), pretty, useful and with the right engine, is jolly good fun to drive. The model I was lucky enough to experience was the 3 litre rocket that, incredibly, had a delightful exhaust note and revved to high hell. Since starting to explore the world of performance SUVs, I’ve been hugely surprised by how fun and capable they can be, even compared to cars that are tuned and designed to be a giggle and not much more. The F-Pace was possibly the quickest thing I’ve ever been in, not just from an A to B speed perspective but how it felt. It was rapid. The car moves with no effort whatsoever, which is impressive given it weighs over one and a half tonnes. The amount of kit you get in the cabin is good and works well. My test vehicle had the optional, slightly larger touchPro infotainment system with upgraded Meridian sound system. It was good and responsive, nothing to write home about but all very nice to the touch and with all the gizmos you would expect from a car with the price tag. What did tickle my technological fancy was the two buttons you find just in front of the rear-view mirror. Protected by a thin plastic cover that you push to release, is one button to report a mechanical fault and one to call the emergency services. Now, I’m fully aware these are not new or particularly premium features in a car of today. Volkswagen, Vauxhall, Toyota and Volvo to name a few have been doing this for a number of years but there was something nice about having two, dedicated buttons above your head to activate the service. Don’t ask me why but it made me feel safer, that has to be worth something? So, the car comes with some nice options, it’s comfortable and you can transport many large and important things around in it. None of these points are particularly unique or interesting. I am telling you now, as a man who enjoys cornering at speed, this is a car that gives you that “I can’t wait to get back into you” feeling that a car worth its salt should. It very nearly took my eyebrows off it was that sticky into the corner. My route took the car over every kind of road you’d want; winding village roads, long sweeping B roads and blasts of motorway. It was great everywhere. Body roll was practically non-existent and when you place the smooth and very responsive auto gearbox into sport, alongside the dynamic drive control, you are going to work hard to not lose your licence. Like most sporty cars now, you’ve got the flappy paddle gears sat on the steering wheel but to be honest, you don’t really need them. My Alfa Giulia is equipped with big, obvious paddles and it works on something like that but the F-Pace’s gearbox and power delivery is so good that you just forget they are there. The whole drive was just sublime. Even into the tight corners of small country villages, the steering is so precise that you don’t even realise you are in such a big unit. The F-Pace genuinely feels like the result of a meeting at Jaguar headquarters where everyone agreed to make the F-Type slightly taller and able to handle a trip to Ikea. I’m sat here, three days after driving it, and my jaw still hasn’t removed itself from the floor. The Jag really is that good. When I first showed up to the showroom, I thought the F in F-Pace stood for feasible or four wheel drive. Once you get in one and put your foot down, you find yourself using a whole new range of F words as you take off. The truth is, that F should stand for Fantastic….. Older PostNext, M & S, Porsche, Ted Baker…Porsche?